ALTAMONTE SPRINGS, Fla. (Oct. 11, 2017) — Window Interiors, a leading specialty subcontractor, has been recognized yet again by the Central Florida Chapter of Associated Builders and Contractors for its outstanding work. Each year, ABC Central Florida awards excellent projects by its members with an Eagle Award. This year, Window Interiors was honored for its work on the Brannon Civic Center in New Smyrna Beach. This is the fifth year in a row Window Interiors has brought home the honor. 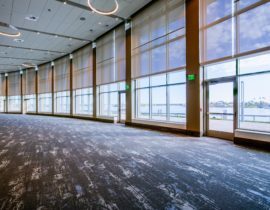 The Brannon Civic Center is a 13,900-square-foot convention center featuring a grand ballroom that can accommodate many kinds of community events. The space has large window that maximize light and views of the Indian River. Window Interiors worked to make the center as energy efficient as possible, installing a system that tracks the sun and automatically adjusts the shade position on the windows. This is not the first time Window Interiors has been honored for its outstanding work in the construction industry. Not only did the company receive an Eagle Award last year for its work on Florida Hospital for Women, it won the prestigious Subcontractor Award for Excellence from ABC. Window Interiors was also recently named to ENR Southeast’s Top Specialty Contractors list for the second year in a row. Window Interiors provides window treatment solutions for all types of commercial buildings, including healthcare, multi-family, hospitality, offices, restaurant and retail and education. In addition, the company provides and installs Division 10 specialty construction items. For more information, visit www.windowinteriors.com. Founded in 1989, Window Interiors, a Best Practices Company™, was named a 2016 and 2017 ENR Southeast Top 100 Specialty Subcontractor and is an industry leader serving clients across the country with commercial window treatment solutions. The company provides window treatments for all types of commercial buildings including; healthcare, multi-family, hospitality, offices, restaurant and retail, education and general commercial. In addition, the company provides and installs Division 10 specialty construction items. For more details call (800) 654-9818, or visit www.windowinteriors.com.